Many Real Housewives of Orange County fans were shocked when Jim Bellino and Alexis Bellino announced that they were divorcing last June. The couple always painted a picture of a happy marriage. But in Orange County, things are often not as they seem. Since Alexis turned in her orange after Season 8, she has been flying under the radar, for the most part. We don’t always have a good picture of what is going on in her life, other than lots of activities with her children and an occasional luxury vacation from her Instagram posts. Now, Alexis has a new boyfriend named Andy Bohn. She has gone public with her new man in a big way. She posted the first known photos of the two together yesterday. Alexis made it Instagram official with Andy on Sunday. And as everyone knows, when you announce your relationship on Instagram, it must be serious! Alexis posted two photos with Andy over the weekend, both of them wearing Los Angeles Rams gear (OK, that part didn’t work out for them)! One of the photos of Alexis and Andy has a link to a brand new Instagram account, acbohn, in the caption. The profile bio states that it is ” just a fan page” for Alexis and Andy. Most likely, she set up her own couple’s fan page. That might be a Housewife first! She replaced that caption with “RAMS fam here. #loveisintheair. #myforever.” Why did she change the wording on her post? Did Alexis think that she revealed too much, too soon? 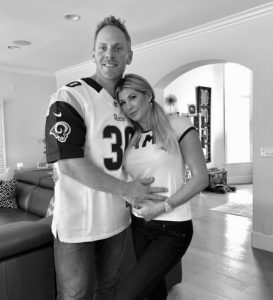 Alexis and Jim filed for divorce last June, after being married for 13 years. The former couple, who share three children, had one of the most talked about marriages in Housewife history. Many of her former costars believed that Alexis was dominated by Jim and found it difficult to relate to her. Only time will tell how this new relationship progresses, but it is clear that Alexis has moved on and she is not shy about announcing to the world that she is in a new relationship. TELL US- WHAT DO YOU THINK ABOUT ALEXIS’ NEW ROMANCE? IS IT TOO SOON TO JUMP INTO A SERIOUS RELATIONSHIP? WOULD YOU SET UP A “COUPLE’S PAGE” FOR YOUR NEW RELATIONSHIP?